Kwilty Pleasures: A GHASTLIES PEEP SHOW! because its a large novelty print. Like these older Ghastlie prints I selected for this top! With shaking hands I "finally" cut them! if sitting on a shelf collecting dust! "Red Velvet" which has big main blocks! 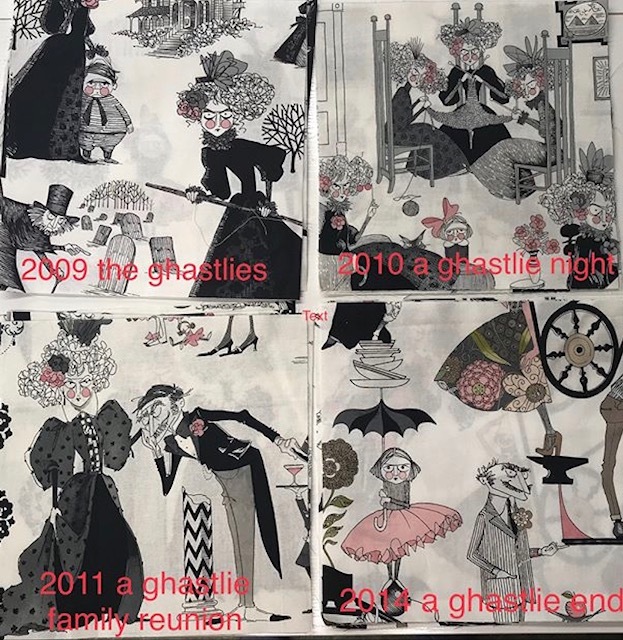 who first used this pattern for her Ghastlies fabric. are not X blocks...just partial. to make all X blocks! I love when he looks at my work and offers great input. and often sees things, I don't! "accented" with a fabric that pops. I choose a Kona green! The same green is used in the border! Oh yes...this is gonna be amazing! makes this Ghastlie Girl happy! and ready for a beach photo op! This beach house reminded me of Widows Peak! The beach sand bags always make a great prop! and I am not afraid to tresspass for a photo opp! I will climb lots stairs to get that perfect shot! In May, I have a quilt retreat and I'll make a backing for it. I have LOTS of Ghastliness fabric I can use. My goal is use it NOW! Not me! I’m a rule follower. Ocean Isle Beach....one of my fav places to visit!!! Love that fabric...got to get myself some!! Wow that turned out lovely and the name is awesome. How perfect! I still haven't cut into my Ghastlies fabric - I'm a wimp, I know. But you inspire me!